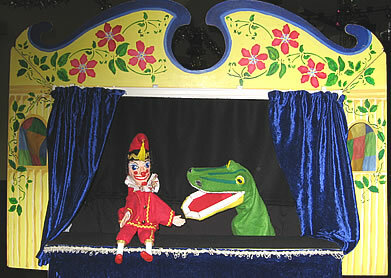 The ancient puppet show of Punch & Judy has delighted generations of children and adults. Each show is unique, depending on the character of the puppeteer. In Jenny’s shows, Punch is more like a naughty boy than an evil murderer. There is no judge and no gallows humour. Instead, it is 20 to 30 minutes of madness and mayhem as Punch tries to babysit, meets the clown Joey and tries to prevent the crocodile from eating the sausages. Sometimes the doctor visits with his brand of medicine (a “ticklelickerish” stick) and sometimes the policeman tries to arrest Punch but in the end Mr Punch, like a naughty schoolboy, charms everyone into enjoying his show.